Screening and Production of Biogas from Macro Algae Biomass of Padina boergesenii, Colpomenia sinuosa, and Ulva sp. This chapter focuses on the bioprospecting of macro algae species in the Arabian Gulf, Abu Dhabi coast. Three species of macro algae were collected and subjected for detailed analysis and determination of biogas potentials, Padina boergesenii, Colpomenia sinuosa, and Ulva sp. 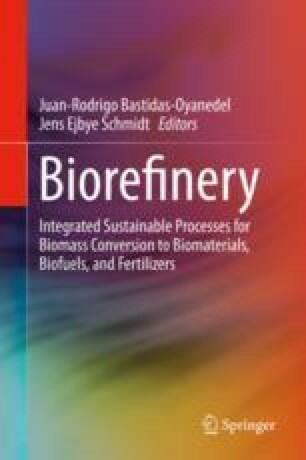 Composition analysis and elemental analysis were used to determine bioenergy potentials. Anaerobic digestion of the three macro algae samples was carried out at two different volatile solid loadings (0.2 and 0.5%). The results showed significant methane yield for all three species, with Ulva sp. yielding higher methane production compared to Padina boergesenii and Colpomenia sinuosa. Biogas production for Ulva sp. was furthermore carried out at 1%, 3%, and 5% VS loading. The highest specific methane production for Ulva sp. was observed with 1% VS reaching 223 ml_CH4/gVS in 27 days. Biogas Macro algae Seawater Padina boergesenii Colpomenia sinuosa Ulva sp.